Enjoy Something Blue every Saturday night at ten. This week we’ll hear William Lee Ellis recorded at Blue Monday. For more about the show visit the Something Blue website at sbblues.com. Don’t miss Something Blue, Saturday night at ten, on KASU. 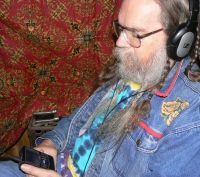 All right now, we’re listening to William Lee Ellis recorded live at Blue Monday at the Red Goose Deli on October 18, 2010 in Paragould, Arkansas. We heard “Maple Leaf Rag”, “Maybelline”, “Mean Old Frisco”, and “Midnight Shift”. He really put on a good show entertaining us with his stories and songs. You’re listening to Something Blue on KASU, 91.9 FM and streaming on the internet at http://kasu.org. KASU hosts Blue Monday, Bluesday Tuesday, Jazz Thursday, and Bluegrass Monday. I record the Blues and the Jazz for Something Blue. The Something Blue website is at sbblues.com. And you can find William Lee Ellis at http://williamleeellis.com. William Lee Ellis’s father, Tony Ellis, played with Bill Monroe and the Bluegrass Boys. Bill Monroe was his Godfather so he learned from the masters. Tony Ellis is a renowned banjo picker and fiddler. Sometimes William Lee tours with him. Here’s a folk song they both like to do, “Jesse James”. Oh yeah, that’s William Lee Ellis doing a song by Blind Blake, “Police Dog Blues”. Before that we sang along to “What’s The Matter With The Mill”. I hope you enjoyed that as much as I did. You just can’t beat Memphis Minnie for the down and dirty double entendre. Now we’re going to hear an original song Ellis cowrote with Thomas Grundy, a Shakespearean scholar who lives in Japan, “Snakes In My Garden”. Now that’s the Blues. Robert Johnson’s “Love In Vain”. We’re featuring William Lee Ellis recorded at a KASU Blue Monday show on October, 18, 2010. Feel free to join in now as we sing along to “Old Time Religion”. William Lee Ellis was raised on Bluegrass but now he brings his own thing to the Blues. Here’s a song he cowrote with Susan Marshall that was picked up by Ana Popovic, “How The Mighty Have Fallen”. Now that’s what I’m talking about, William Lee Ellis doing the Reverend Gary Davis tune, “Sally Where’d You Get Your Liquor From”. Before that we heard “Kentucky Blues”. I love his insight into the music and his wry sense of humor. You’re listening to Something Blue on KASU, home of the Blues every Saturday night. Tune in at 91.9 FM or listen on the internet at http://kasu.org. Learn more about William Lee Ellis at http://williamleeellis.com and you can find the Something Blue website at sbblues.com. You can find me on Facebook and on The Delta Boogie Network at http://deltaboogie.net. I’ve got three more great songs for you tonight, “Northern Lights”, “Dust Will Write My Name”, and “Samson And Delilah”. There’s no music like live music. KASU promotes Blues, Jazz, and Bluegrass every month. The shows are free. Please come and join us. Until next time this is Hairy Larry reminding you once again, Blues is the mainstream. Now here’s William Lee Ellis.